Welcome to yet another installment of "yo go re is an unobservant idiot." 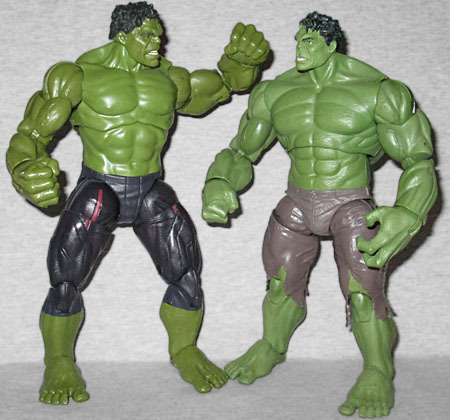 When the first Avengers came out, I got the Marvel Select Hulk because I thought the Marvel Legends version was going to be garbage. 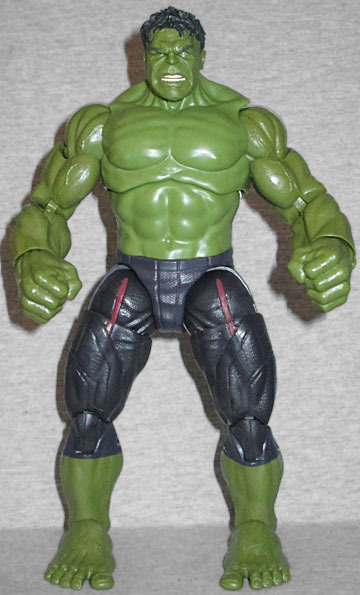 And now that Avengers 2 is on the way, I thought the new Hulk was a glorified repaint. Wrong again, Dumb-dumb! 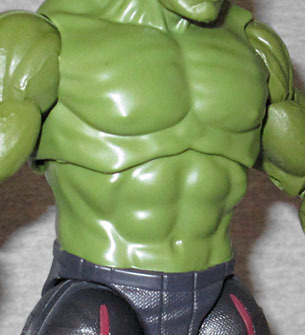 We'll start with the important thing: Avengers 2 Marvel Legends Hulk is nearly all a new sculpt. The only parts that are shared with the previous version are the shoulders, arms, shins, and feet. Honestly, that's it. His fists? New. His torso? New. His Avengers-branded yoga pants? All new. I was expecting maybe new thighs, and everything else to just be a question of paint, but nope, Hasbro did not cut corners that way. Unfortunately, they chose to cut corners in a different way. Remember how the previous Hulk had a fine texture over all his skin, making him look like a real creature? Obviously that's still here on the arms and feet, but the torso is smooth and plasticky. It's a bit distracting, honestly. Apparently 100% of the "let's adequately detail this" budget went to his techno-capris, because everywhere those don't have thick, geometric bands, they've got a subtle and intricate herringbone pattern. We'd have gladly traded that for skin that didn't look like it wasn't finished rendering when the digital sculpt was sent to tooling. The head on this figure is slightly larger than the old one (though their neck joints are the same size, so you can swap them if you feel like it). A larger sculpt means more potential detail, and this one delivers. The quality of the head, angry scowl and all, far surpasses the quality of the chest. The mouth is open slightly more than the last figure, but the small details - such as the exact placement of the wrinkles between his eyebrows - are the same. His articulation is the same as the first movie's Hulk: a large balljoint for the head, swivel/hinge shoulders, double-hinged elbows, swivel/hinge wrists, a balljointed torso, swivel/hinge hips, swivel thighs, double-hinged knees, and swivel/hinge ankles designed to work like rocker joints. The torso joint is a little loose, but that might vary from figure to figure. What will always be the same, though, is the way the "hinge ring" in the hips and wrists is larger than the surrounding body. It's not as bad as the shoulders on Man-Bat, but it's not great, either. Also, it would be nice if you could flex his feet forward, not just back, and if you could raise his head more. As part of the Avengers 2 Marvel Legends, Hulk comes with a piece of the series' Build-A-Figure, Thanos. It's the right arm, done in dark blue with gold and silver accents. 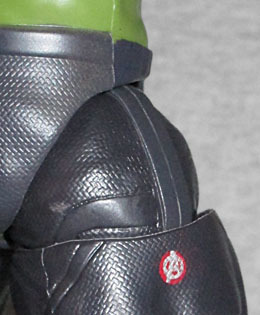 It's just a bit smaller than Hulk's own arm, which should give you a rough idea of how large the BAF will be. If not for the BAF piece, I wouldn't have bought Hulk; the one from the first movie was good enough. But if you're one of the many, many fans who never got that one, or even if you're just looking to build Thanos, this is a really nice release. The lack of texture on the chest and the design of some of the joints is disappointing, but if Avengers 2 is anything like Avengers, after May 1st we're going to be really glad this toy exists.